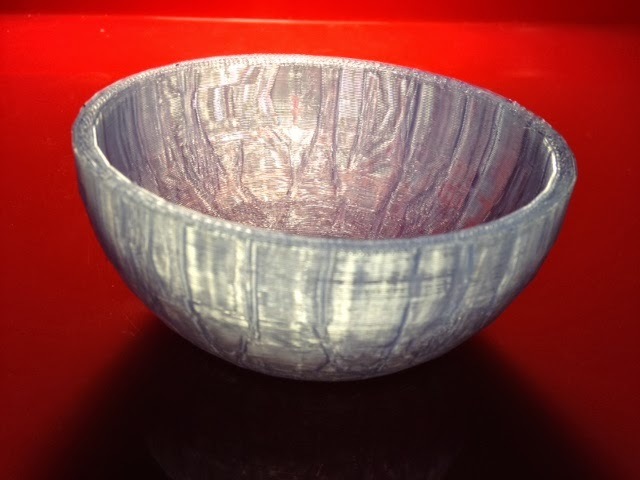 I love the look of Kulitorum's beautifully simple Salt Bowl on Thingiverse, but I couldn't get it to slice with MakerWare so I remade it in Tinkercad from a truncated sphere shape. Settings: MakerWare "low" in just under an hour. Technical notes: With the translucent blue filament on hex fill we could see the fill through the bottom of the bowl, so we started over and printed this with "sparseInfillPattern": "sharkfill" in the profile (and also "doRaft": false). Sadly the fill was no longer visible on the bottom with that profile, but it did make a nice pattern up the sides that looks better than the regularity of the usual hex fill.